The former president faces charges of corruption and ordering the killing of protesters – a charge which carries the death penalty. 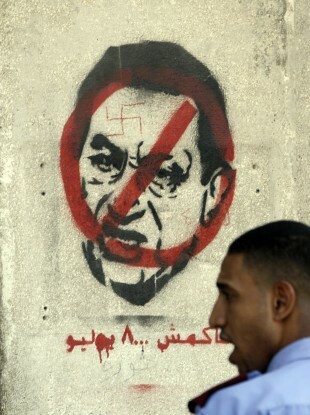 Anti-Mubarak graffiti in Tahrir Square, Cairo. THE FORMER PRESIDENT of Egypt Hosni Mubarak is to go on trial in Cairo today charged with corruption and ordering the killing of protesters during the mass demonstrations earlier this year which forced him from office. The charge of killing protesters carries the death penalty, according to BBC News. Mubarak is reported to have left the hospital in the resort of Sharm el-Sheikh where he has been under house arrest. He is said to have departed in an ambulance and is flying to Cairo for the trial. His sons Alaa and Gamal, ex-interior minister Habib el-Adly and six former officials will also be in the special court constructed at Cairo’s police academy, which was formerly known as the Mubarak police academy. The trial had been expected to take place at the Cairo convention centre but was moved amid security concerns. Indeed, security is tight with a cage being built around the defendants and an estimated 600 people to watch proceedings in the court room. The 83-year-old Mubarak has been under house arrest at the hospital in Sharm el-Sheikh since April. It has at various points been reported that he is severely ill and even that he fell into a coma but he was declared fit to stand trial last month. His son’s Alaa and Gamal, who have been in a Cairo prison since April, are facing charges of corruption. Mubarak had been grooming Gamal to succeed him before his ouster. Prominent businessman and Mubarak confidant Hussein Salem is being tried in absentia. He has fled to Spain, and Egypt is demanding his extradition. Former Interior Minster el-Adly and six high-ranking security officers are charged with ordering the killing of protesters during the 18-day uprising. The former president is being tried for both corruption and ordering the killings of protesters. His family is suspected of amassing billions of dollars from corrupt business dealings while nearly half the 85 million people in his country subsisted at poverty levels around $2 a day or less. Mubarak resigned after 18 days of protests on the 11 February which centred on Cairo’s Tahrir Square. Some 850 people were killed in the uprising although linking the crimes to Mubarak and proving that he gave orders to kill may prove difficult. Protests at Tahrir Square have continued in recent months despite Mubarak stepping down with many unhappy at the pace of reform under the country’s current and temporary military government. Email “Egypt: Mubarak goes on trial facing charges which carry death penalty”. Feedback on “Egypt: Mubarak goes on trial facing charges which carry death penalty”.